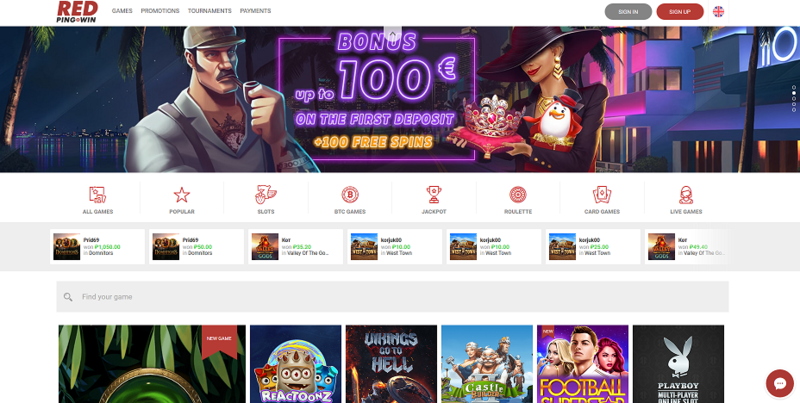 Join RED PingWin Casino, a real money gaming site with hundreds of Slot machines and other games by Microgaming, Yggdrasil, NetEnt, and other top-notch developers. Launched in 2017, the Casino holds a license from Curaçao and is ready to make its players happy. Will you be one of them? Here's what you get when you join RED Ping Win Casino for the first time. As a new player, you qualify for a welcome bonus package that features free spins and free cash. Both bonuses are triggered by your first deposit. 100 Free Spins: the free spins are an immediate bonus and let you play 100 rounds of real money online Slots. Eur 100 Cash Bonus: the free money comes as a match bonus on your first deposit. RED Ping Win 2x your first deposit (instantly) up to a maximum of Eur 100. As usual, the full rundown of the Terms and Conditions that apply to this bonus package is available on the RED Ping Win Casino website. Also, this operator offers weekly bonuses and Slots tournaments with generous cash prizes. Don't let the simple design of this casino site mislead you. While RED Ping Win might not look like the Bugatti of online casinos, it could very well have the heart of a Ferrari hidden under the shell of a Volkswagen Golf. The two main colours of the platform - white and red - dominate a professional-looking platform that is easy on the eye and where everything seems to be in the right place. Once you land on the RED Ping Win Casino website, everything that matters is no more than one click away from you. 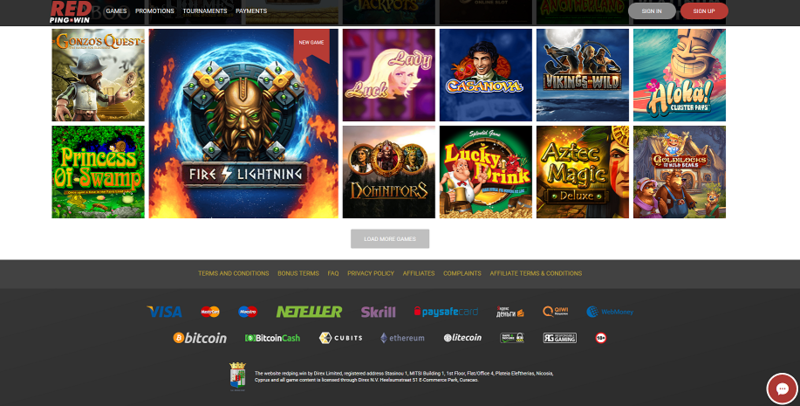 The latest promotions are on the top banner and a ticker showing the latest winners introduces the best part of this Casino website: the games. If you already know what game you want to play, you can skip all that and use the site's internal search. In other words, you'll find a lot of games to play there - be it Slot machines, Blackjack, or Roulette. Important: the page is available in Russian, English, German, Finnish, Polish, Swedish, and Norwegian. RED PingWin Casino sports a huge Slot selection that features both well-known and less popular Slots. All games are available in demo mode, which means that you can play them for free. I suggest you do this because it’s the best way to determine the quality of a Slot. 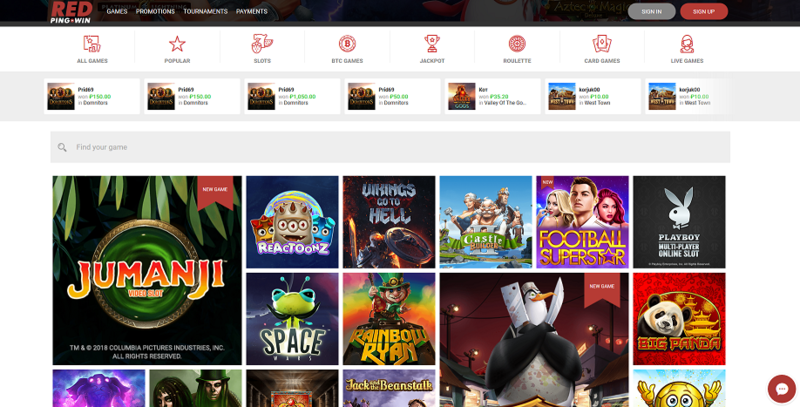 Let’s not forget the Jackpot section, which features a vast selection of Jackpot Slots from Yggdrasil, EGT, and Betsoft. Make sure you play Ozwin’s Jackpots, A Night in Paris, and Holmes and the Stolen Stones. It’s no easy feat to find a good Bitcoin Casino these days. That’s why the BTC games section at RED PingWin Casino is so useful to cryptocurrency gamblers. However, the variety is not so spectacular. The majority of BTC games here are Slot machines. There are a few other choices like Roulette, but they are few and far between. The Card and Roulette sections at Red PingWin are not as impressive as the Slot section. There are four Roulette games, and a few variations of Blackjack, Baccarat, and Video Poker. In addition to the Slots and table games, RED PingWin Casino offers a live dealer section that includes live games from Ezugi and NetEnt. Here, you can play Blackjack, Roulette, and French Roulette with the company of live dealers. You can access RED PingWin Casino and play from your Android or iPhone as the site supports all kinds of mobile devices. However, at the moment of writing this review, there is no RED PingWin app available to download. It’s easy to get your questions answered at RED PingWin Casino. Take a look at the bottom-right corner of your screen and click the red button. An instant live chat will open and you’ll speak with a customer agent in no time. Alternatively, you can go to the Casino’s FAQ section if your question is related to your account, bonuses, website, deposit, or withdrawal. RED PingWin Casino is a good option to play real money Casino games in 2018, especially if you are interested in Slot machine games and Slot tournaments. Even though the site features some table games, their selection is rather limited - and I find hard to imagine this could appeal to anyone other than beginners. Other than that, I find RED Ping Win to be a fine Casino site. Their welcome bonus package is good, the selection of games on offer is more than plentiful, and the opportunity to win Bitcoin online is also a good plus. There are many deposit options on RED Ping Win Casino. You can choose the most convenient one for you.